Value investing has been enduring a tough time. This is certainly true for my own portfolio. I’m down 7.72% year to date compared to an 8.34% gain for the S&P 500. It’s times like this that it helps to look to history. We’re currently in an era where investors are gobbling up growth companies and they don’t care what the price is. I remember the same mood back when I was in high school. People forget, but the bubble wasn’t simply concentrated in dot-com stocks. The bubble was pervasive among even the most stable of blue chip companies: Cisco, Microsoft, Coca Cola. Going further back in history, the same euphoria characterized the Nifty Fifty era. The Nifty Fifty was a group of 50 stocks in the early 1970s that grew by leaps and bounds in the 1960s. Many of them were exceptional companies (like McDonalds and Xerox), but the euphoria pushed their valuations to extraordinary levels. Predictably, valuations came crashing down and investors were burned. Every bubble has something in common. There is something new and exciting in the air that promises to change our lives and this fuels speculation. It starts with a truth (i.e., real estate is an excellent investment for the middle class) and then descends into temporary madness. Of course, the market always corrects this madness. Eventually. During the dot-com bubble, it was the promise of the internet. The internet was going to transform the way we live and everyone could see it . . . so, Cisco Systems was valued more than General Electric and Pets.com was a thing. They were right about the promise of the internet but wrong about the impact on stocks. Adding fuel to the fire was the promise of the “new economy”. Productivity was surging at the time. Productivity is the key ingredient in economic growth, so the belief was that we were entering an era of permanently higher growth. This fueled predictions of the federal budget deficit going to zero in 10-20 years. In truth, productivity was simply reverting to the mean after stagnation in the 1970s and 1980s. Keep this in mind when commentators say that the current productivity slump is permanent and means that the US economy will never grow faster than 2%. With the Nifty Fifty, it was optimism about the power of the post-World War II American economy. The 1950s were a good time for the American economy and the 1960s were even better. The unemployment rate was only 3.9% by the end of the decade. Americans experienced abundance that was foreign to them in the past. Suburbs popped up everywhere and car ownership became ubiquitous. In the 1970s, the good times took a hit due to inflation, an oil shock, and the confidence-sapping Watergate scandal. Also, disco. Unaware of what was about to happen, investors thought that you could simply buy the fastest growing companies in the world’s fastest growing economy, and price didn’t matter. With the South Seas bubble, it was the promise of the age of exploration. The New World opened up two continents that were rich in natural resources and abundance. Surely, investing in the company that would dominate trade in the new era was a surefire bet. Value stocks are going through the longest cycle since World War II of underperformance versus growth. Each period of time that growth outperforms value, value eventually stages a significant resurgence. Their chart showing this history can be accessed here. They also have a great analysis of the performance of different valuation metrics since 1970. They find that using enterprise values instead of raw market prices in a valuation ratio works best. They find that all of the major valuations work and, as is demonstrated in Deep Value, the acquirer’s multiple (in both the EBIT and EBITDA variations) exhibit the highest performance. The comparison of different valuation metrics can be accessed here. I don’t know when or how the current cycle will shake out. I am confident in one thing: buying expensive stocks is dangerous and buying cheap stocks is a safe long term bet, no matter how you slice it. The current disconnect will not last forever. I think indexing makes sense over the long run and I don’t think we’re on the brink of a 1929 or 2008 scenario. 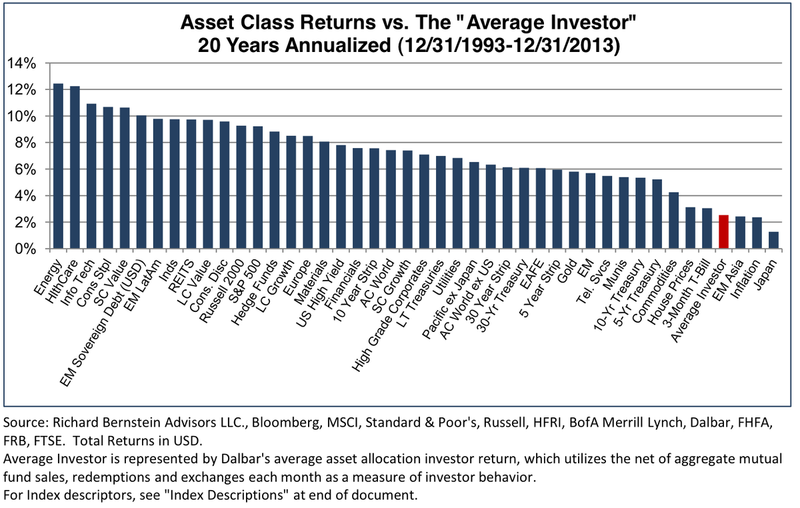 With that said, I do think that this current environment is fueled by performance chasing, just as it was in the 1990s. Just like the 1990s, money is pouring into large cap index funds. As index funds concentrate their bets on the biggest components of the index, those companies see their valuations increase. This isn’t due to any change in their actual business performance but is due to their weighting in the index. The money pouring into index funds is not permanent capital and I suspect many will head for the hills once the current cycle turns on them, as usually happens. Most investment strategies work and make no mistake: indexing is simply a strategy. It’s a smart, tax efficient and cheap strategy. It will only work for investors if they stick to it, which they typically don’t, as demonstrated by this chart. Value is having a tough time, but it’s times like this that are the reason value investing works over the long run. If value investing delivered double digit returns every year consistently, then everybody would do it. The strategy I am pursuing is consistent with Ben Graham’s recommended strategy from the 1970s: buying low P/E stocks that have safe balance sheets. I look at other factors (such as the enterprise multiple), but that’s the gist of what I’m doing. When looking at my own performance, I compare it to this backtest of the strategy done over at Alpha Architect. In 1998, the 20-stock variation of the strategy lost 9.01%, compared to a 26% gain in the S&P 500. In 1999, the strategy gained 4.55% against a gain of 19.53% in the S&P. The worst year for the strategy was 1969, in which it lost 28%. The S&P lost only 8% that year. Over the long run, however, Ben’s simple (but not easy) strategy delivered a 15% rate of return. That’s the long run return I’m striving for with this IRA over the next few decades. I don’t know how long the doldrums will last, but I do know they will end. It may take years, but I’m not going to abandon it. The only thing I may change if the market takes a hit is to shift my focus to asset-based investing (i.e., net nets and stocks below tangible book). The only reason I’m not doing that now is that they are not available in sufficient quantities.